The Tarnished are those who lack the skill required to become a Clockwork Apostle and lack another desirable skill to be a merchant, craftsmen, and other roles. As a result they are cast out and become Tarnished. The Tarnished live in the realm of The Clockwork city within the city The Brass Fortress Within the slums of Slag Town and in the outlaw refuge. The Tarnished feel abandoned by the Clockwork Apostles and often have to rely on themselves to get by. 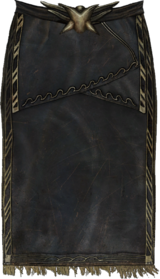 The Ternion Monks was a monastic order based in Skyrim. They were dedicated to the worship three animal totems: bear, wolf and fox, collectively known as the Three Old Gods. Their religion itself is ancient, dating back the Atmorans and their worship of the animal totems. The monks are also known for their healing magic, and can call forth aspects of the Three Old Gods. With the help of these spirits, the monks can perform tasks beyond the scope of mortal limitations. The Ternion Monks typically worship and meditate in holy retreats that are almost inaccessible outsiders. Often, access to these temple is only possible with the use of magic, and entry to outsiders is only granted if they are in great need and are worthy. By the Second Era, the order was in decline as very little proselytizing took place and fewer and fewer converts took up the worship of the Three Old Gods. In 2E 582 the Ebonheart Pact sought the aid of the Ternion Monks in order to cure High King Jorunn, who was suffering from the effects of a potent Daedric poison. The Soulless One, with the aid of the aspects of the Three Old God, entered Joruun's nightmares and saved him. Thrafey is one of the vampire bloodlines of the Iliac Bay area. The Tribunal Temple was the native religion of the Dunmer of Morrowind. They worshipped Almalexia, Sotha Sil, and Vivec, known together as the Tribunal or Almsivi. Most people usually just call it "the Temple". They accept outlanders as members, but most of the few outlanders that do join, join only for the services provided. On Vvardenfell, the Temple District included the city of Vivec, the fortress of Ghostgate, and all sacred and profane sites (including those Blighted areas inside the Ghostfence) and all unsettled and wilderness areas, as the Treaty of the Armistice with the Empire maintained the island as a Temple preserve. In practice, this district included all parts of Vvardenfell not claimed as Redoran, Hlaalu, or Telvanni Districts. This page was last modified on 14 October 2018, at 08:36.